These facts are reasons enough to be diligent with the use of sun protection. There are two kinds of sunscreens- physical blockers and chemical blockers. Physical sunscreens work by blocking UV rays from reaching your skin. Chemical sunscreens work by absorbing UV rays that reach your skin. One is not more effective than the other; however, physical sunscreens are typically better for sensitive skin. Apply at least an SPF 30 daily to the face, ears, neck and chest as well as to any other areas where sun exposure is expected. When using moisturizer or makeup that contains sun protection, note that you are not receiving the full amount of SPF that is listed since the SPF is diluted into the moisturizer or makeup. 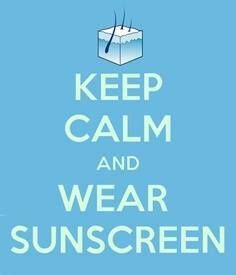 In addition to daily sunscreen use, daily topical antioxident application to the skin is advised. UV rays, pollution and other environmental exposures generate damaging free radicals that prematurely age skin. Antioxidants such as Vitamin C neutralize free radicals and provide powerful defense against photoaging and in all likelihook, skin cancer. Clinical studies have demonstrated the stimulation of collagen production and improvement of the appearance of fine lines, wrinkles, laxity and hyperpigmentation with the use of specific antioxidant formulations. Since you receive up to 80% as much UV exposure on cloudy days versus sunny days, it is crucial to wear sun protection every day, no matter the season.